Draft: 2010, Chicago White Sox, 7th rd. Graduated from the Charter School of San Diego ... Attended Palomar (CA) College and was 2008 Pacific Coast Conference Player of the Year ... Transferred to Oral Roberts University prior to his junior season, where he was named 2009 Summit League Newcomer of the Year and 2010 Conference Player of the Year ... Was inducted into the Oral Roberts University Athletic Hall of Fame in 2017 ... Completed his degree in sports management at Oral Roberts during the 2017-18 offseason ... Is a contributor to Kids Steps to Success, a nonprofit organization in San Diego that helps middle school and high school-aged kids receive the proper training in softball and baseball along with access to a learning center ... Enjoys fishing and hunting.....follow him on Twitter (@SaladinoTyler). Began the season with Chicago-AL, appearing in 6 games and going 2-for-8 ... Made 3 starts with the White Sox (2g at 3B, 1g at DH) ... Was traded to Milwaukee on 4/19 in exchange for cash ... Batted .246 with 5 HR and 16 RBI in 52 games with Milwaukee ... Made 27 starts with the Brewers (25g at SS, 1g at 2B, 1g at 3B) ... Had three stints with the team (5/9-5/29, 7/5-7/31 and 9/1-end) ... Also appeared in 36 games at Triple-A Colorado Springs (.262, 3hr, 19rbi, 10sb) ... Was on the 10-day disabled list from 5/30-7/4 with a left ankle sprain ... Notched a pinch-hit, inside-the-park homer on 5/14 at Arizona.....was the 28th inside-the-park homer in franchise history (first as a pinch-hitter) ... Gave the Brewers a 5-4 win on 7/24 vs. Washington with a walk-off sac fly in the 10th inning ... Belted his second career pinch-hit homer on 9/1 at Washington, a solo shot off Justin Miller ... Was not on the NLDS or NLCS rosters ... Signed a 1-year contract on 11/30, avoiding arbitration. Appeared in 79 games in his third season with the White Sox … played in 26 games (26 starts) at second base, 22 (18) at third, 13 (12) at shortstop and three (zero) at first … committed just four errors over 261 total chances (.985 fielding pct.) ... Was the White Sox leadoff hitter in each of his first six games, going 5-21 (.238) with two doubles and four walks … went 2-4 with a run scored on Opening Day vs. Detroit ... Was placed on the disabled list on 5/27 with back spasms … appeared in six rehab games with Class AAA Charlotte before being reinstated on 7/14 … made the start that night at Seattle as the second baseman, going 1-3 with a double and RBI ... Recorded two RBI on 8/20 at Texas, his first multiRBI effort since 4/24 vs. Kansas City … was 2-4 on 8/31 at Minnesota, his first multihit effort since 8/3 at Boston ... Did not record a multihit effort and registered just one RBI over his final 17 games from 9/1-10/1. Appeared in 93 games in his second season with the White Sox … started 39 games at second base, 28 at shortstop and 10 and third base … also appeared in three games in the outfield.  Recorded a .976 fielding percentage (8 E/340 TC).  Hit .329/.369/.430 with one home run vs. left-handers, compared to .265/.296/.402 with seven homers vs. righties.  Batted .324 (23-71) with RISP (.344 with RISP/two outs).  Improved his numbers from .250/.289/.411 in the first half to .301/.332/.409 after the break.  Made his first start at shortstop on 4/7 at Oakland, going 2-4 with a RBI … drove in his first run on 4/14 at Minnesota … hit his first home run of the season on 4/20 vs. Los Angeles-AL.  Hit safely in seven straight starts from 5/6-21 (.407, 11-27) … connected on a go-ahead, RBI single in the sixth inning on 5/11 at Texas … the Rangers went on to a 6-5 win.  Forced extras with a game-tying sacrifice fly in the bottom of the ninth inning on 5/17 vs. Houston … hit on a three-run homer on 5/28 at Kansas City, his first career on the road.  Hit a game-winning, two-run home run in the eighth inning on 5/31 at the Mets … went 2-4 with a two-run homer and careerhigh four RBI on 6/14 vs. Detroit.  Registered his second career game-ending hit with a RBI single in the ninth off Mike Montgomery on 7/25 vs. the Cubs.  Connected on a solo homer on 8/6 vs. Baltimore, his first since 6/29 vs. Minnesota … was 1-3 on 8/24 vs. Philadelphia in his return after missing four games due to back soreness.  Matched his career high with three hits, including a two-run home run, on 8/27 vs. Seattle.  Drove in all three White Sox runs in their 4-3 loss on 8/29 at Detroit … recorded a two-run single and a solo home run.  Registered three consecutive three-hit efforts from 9/7-10, and hit safely in four of his last five contests from 9/14-20.  Missed the last 10 games of 2016 (lower back). Played in 68 games (60 starts) after being recalled by the White Sox on 7/10 from Class AAA Charlotte. ... Appeared in 60 games (53 starts) at third base, 11 (seven) at shortstop and one (zero) at first base … recorded a .974 fielding percentage (5 E/193 TC). ... Hit .260 (19-73) over 18 games in July, .219 (23-105) in August (26 G) and .208 (10-48) in September (20 G). ... Went 9-32 (.281) with one home run and three RBI over eight interleague games … was 3-9 (.333) vs. St. Louis. ... Was recalled from Charlotte on 7/10 … made his major league debut that day at the Cubs as the third baseman (0-3). ... Started 25 straight games following his recall … posted a seven-game hitting streak from 7/11-21, going 11-28 (.393) with two homers, four RBI and a 1.071 OPS. ... Recorded his first hit on 7/11 at Wrigley Field, a RBI triple in the first inning off Jon Lester … went 2-4 on 7/17-1 vs. Kansas City, his first career multihit effort. ... Connected on his first home run on 7/19 vs. Kansas City (off Danny Duffy) … recorded three-hit games on 7/21 vs. the Cardinals (HR, two RBI), 7/25 at Cleveland and 8/21 at Seattle (two RBI). ... Hit safely in seven of eight games from 8/29-9/9, going 9-30 (.300) with a home run and eight RBI … recorded his first gameending RBI with an 11th-inning single on 8/30 vs. Seattle. ... Hit a solo home run on 9/9 vs. Cleveland and tripled in consecutive games on 9/21-2 and 9/22 at Detroit … his triple with one out in the ninth inning on 9/22 broke up the Tigers combined no-hit bid … scored the tying run on Adam Eaton's single. ... Appeared in 34 games at shortstop, 14 as the designated hitter, two at third base and one each at first and second with Charlotte … ranked third on the club with 25 stolen bases. ... Hit .324 (34-105) with four homers and 22 RBI at home, compared to .176 (16-91) with seven RBI on the road. ... Recorded back-to-back, three-hit games on 6/19-20 vs. Indianapolis, going 6-10 (.600) with two RBI and four runs. ... Went 10-31 (.323) with two home runs and 12 RBI over eight games in July prior to being recalled by the White Sox. Batted .310 (91-294) in 82 games with Class AAA Charlotte before suffering a torn UCL in his right elbow on 7/13...Would have ranked fourth in the International League in average and 11th in OBP (.367) with the required PAs...Appeared in 50 games at shortstop, 10 at first base, eight in left field, four at second and three at third...Batted .471 (33-70) with RISP and .330 (31-94) vs. LHP...Homered twice on 4/22 vs. Durham … homered in three straight games from 6/30-7/1...Underwent Tommy John surgery on 8/15 in Birmingham, Ala...Procedure performed by Dr. James Andrews. Ranked ninth in the Southern League with 28 stolen bases at Class AA Birmingham ... Entered the season ranked by Baseball America as the No. 26 Prospect and Possessing the Best Strike Zone Discipline in the White Sox organization. Combined to hit .236 (110-467) with 80 runs scored, 39 stolen bases and 79 walks with Birmingham and Class AAA Charlotte … was successful on 83.0 percent (39-47) of his steal attempts ... Ranked third in the SL in walks (75) and stolen bases (38) and tied for seventh in runs scored (71) ... Reached base safely in 25 consecutive games from 4/12-5/9, the seventh-longest streak in the SL ... Was promoted to Charlotte on 7/30 and returned to Birmingham on 8/17, where he finished the season ... Finished 2012 ranked by Baseball America as possessing the Best Strike Zone Judgement in the SL … entered 2012 ranked by Baseball America as the No. 8 Prospect in the Sox system. Tied for the Carolina League lead in triples (nine), ranked third in slugging percentage (.501) and runs scored (75), fourth in extra-base hits (51) and fifth in on-base percentage (.363) at Class A Winston-Salem ... Was named CL Batter of the Week for 8/15-21 ... Was ranked by Baseball America following the season as the No. 20 Prospect in the CL. Batted .305 (65-213) in 60 games between Advanced Rookie Bristol and Class A Kannapolis in his pro debut ... Posted an 11-game hitting streak from 8/2-14 (.432, 16-37) … was rated by Baseball America as the Best Defensive Player in the Sox draft class … was signed by Clay Overcash. 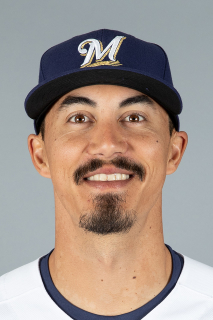 March 22, 2019 Milwaukee Brewers optioned SS Tyler Saladino to San Antonio Missions. September 1, 2018 Milwaukee Brewers recalled SS Tyler Saladino from Colorado Springs Sky Sox. August 1, 2018 Milwaukee Brewers optioned SS Tyler Saladino to Colorado Springs Sky Sox. July 5, 2018 Tyler Saladino roster status changed by Milwaukee Brewers. July 2, 2018 Milwaukee Brewers sent SS Tyler Saladino on a rehab assignment to Colorado Springs Sky Sox. June 28, 2018 Milwaukee Brewers sent SS Tyler Saladino on a rehab assignment to Wisconsin Timber Rattlers. May 30, 2018 Milwaukee Brewers placed SS Tyler Saladino on the 10-day disabled list. Sprained left ankle. May 9, 2018 Milwaukee Brewers recalled SS Tyler Saladino from Colorado Springs Sky Sox. April 23, 2018 SS Tyler Saladino assigned to Colorado Springs Sky Sox. April 19, 2018 Chicago White Sox traded 2B Tyler Saladino to Milwaukee Brewers for cash. July 14, 2017 Chicago White Sox activated 2B Tyler Saladino from the 10-day disabled list. July 3, 2017 Chicago White Sox sent 2B Tyler Saladino on a rehab assignment to Charlotte Knights. May 27, 2017 Chicago White Sox placed 2B Tyler Saladino on the 10-day disabled list. Back spasms. October 3, 2016 Chicago White Sox activated 2B Tyler Saladino from the 15-day disabled list. October 1, 2016 Chicago White Sox placed SS Tyler Saladino on the 15-day disabled list retroactive to September 22, 2016. Herniated disk in his back. July 10, 2015 Chicago White Sox recalled SS Tyler Saladino from Charlotte Knights. May 25, 2015 Charlotte Knights activated SS Tyler Saladino from the 7-day disabled list. April 23, 2015 Charlotte Knights placed SS Tyler Saladino on the 7-day disabled list retroactive to April 22, 2015. March 18, 2015 Chicago White Sox optioned SS Tyler Saladino to Charlotte Knights. November 20, 2014 Chicago White Sox selected the contract of Tyler Saladino from Charlotte Knights. September 16, 2014 Charlotte Knights activated SS Tyler Saladino from the 7-day disabled list. July 17, 2014 Charlotte Knights placed SS Tyler Saladino on the 7-day disabled list. April 2, 2014 SS Tyler Saladino assigned to Charlotte Knights from Birmingham Barons. March 6, 2014 SS Tyler Saladino assigned to Chicago White Sox. August 30, 2013 Birmingham Barons activated SS Tyler Saladino from the 7-day disabled list. August 11, 2013 Birmingham Barons placed SS Tyler Saladino on the 7-day disabled list. January 10, 2013 Chicago White Sox invited non-roster SS Tyler Saladino to spring training. August 17, 2012 SS Tyler Saladino assigned to Birmingham Barons from Charlotte Knights. July 30, 2012 Tyler Saladino assigned to Charlotte Knights from Birmingham Barons. April 5, 2012 Tyler Saladino assigned to Birmingham Barons from Winston-Salem Dash. March 6, 2012 Chicago White Sox invited non-roster SS Tyler Saladino to spring training. May 11, 2011 Tyler Saladino roster status changed by Winston-Salem Dash. March 1, 2011 SS Tyler Saladino assigned to Chicago White Sox. July 14, 2010 SS Tyler Saladino assigned to Kannapolis Intimidators from Bristol White Sox. June 22, 2010 Tyler Saladino assigned to Bristol White Sox from Chicago White Sox. June 21, 2010 Chicago White Sox signed SS Tyler Saladino.